The roads are so quiet. The shops are mostly all closed. There seems to be so much more space, less people, less noise, less hassle. This is wonderful. Why can't every day be more like this? We need more holidays! Less consumerism, more time with the family - with your loved ones, and more meaningful work for everyone. Took total advantage of this beautiful beautiful day this morning. Walked a few laps of the beach to warm up enough so that the first dive under the clear green water felt so esquisitely divine all over my body. And then the next duck dives down with my eyes wide open looking at the tiny little fish swarms and watching the white sandy seabed rolling on and on and onwards into the depths of the wide Pacific was like an underwater meditation. A quick dry off and then home to start Part 2. Yum Cha with my family couldn't have come soon enough because breakfast had long worn off and it was now 11am - the sun and sea does that to you. Enjoy your time off folks - you all deserve it! today isn't a holiday for me. we don't get good friday off (or any time for easter for that matter). lovely photos! 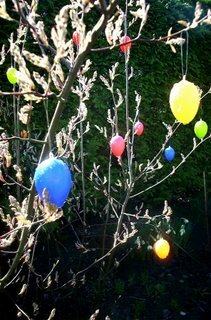 i adore the eggs hanging from the tree. :) have a good holiday! We Love You Cosmos: Danke Schön!!! !